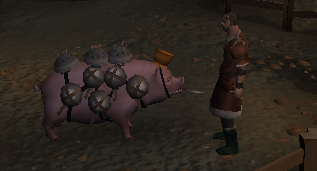 Speak to Eli in the pig farm south of Falador. To start use your explorers ring to teleport to the cabbage patch, and head on over to the pig pen in the west of the farm where you will find Eli (Quest start), alternatively use your Clan Vexillum to teleport to the clan camp and go east. At the pig pen you will find the beautifully voiced Eli with an accurate if not stereotypical farmers drawl and a wild sense of humour. He asks you to test his bacon, to taste it you must accept the quest but that's why you're here. Upon tasting you will be asked your opinion on the bacon, given three options pick which one you agree with. Maybe you could infer it's tastiness from a real life bacon test, especially if you're a bit peckish. After a short conversation full of the advertised "British humour" you are shown a cutscene in which the bacon addicts break in to the pen and dastardly start buttering the pigs for roasting. Eli quickly makes a plan; you have to make decoys to distract the addicts. You are given 9 planks and a heap of bacon, if you don't have room in your inventory, go and make some room then come back. Use the planks to build up the middle decoy at the hotspot and fill it with bacon until Eli removes all the real pigs from the pen to the cellar, you don't need to make the other two decoys as the middle one does the job well enough on its own. After you have carried out the plan you will follow the pigs down into the cellar. Eli asks you what tasks a pig could carry out that would make it useful for things other than bacon, you can suggest three options: the options correspond to what sort of pet pig you'll get at the end of the quest. Choose wisely. Eli then sends you off to see Martin the Master Gardener in Draynor in the hopes of having one of his piglets, to find him walk east from the farm past the border guards and then south to Pigzilla's pen. Martin agrees to give you a piglet if you beat up the person who pickpocketed him, after the conversation you will see the culprits just to your west. The best way is to accuse all of them of the pickpocketing until you get the right one. You character will proceed to thump the pickpocket, upon Martins demands of a harder thrashing you are redirected to a relaxing image of a little kitten and a piglet but unfortunately are not spared the sounds of the beating. "Isn't the pig chubby and cute, and the kitten fluffy and adorable?" In reward for your pummelling of the pickpocket you are given a piglet which you should now take back to Eli in the cellar. Then you must begin training the pig. You will be given the materials to make and upgrade the pig training machine, all you have to do is click the hotspot to build it and once the machine is built simply click it again to upgrade it further. After this is done Eli will ask you for five wheat, you can get them from the field north-east of Draynor, or perhaps you already bought them from the Grand Exchange. Either way you should give them to Eli. But the pig still needs exercise so you need to clear the pen of bacon addicts; to do this Eli gives you his "sleeping potion" which you will apply to one of the pig decoys along with some bacon. You poison the bacon but it doesn't seem to be effective in sending them to sleep. Bring this up with Eli and he reassures you that it just takes a while to work. Eli then suggest that you go and pick 5 onions which he theorises will repel the bacon addicts, they must be picked and cannot be bought on the Grand Exchange. The field nearest to hand is the one just to the south of Draynor village. On your return to Eli you will discover that your cute little piglet has become monstrous in your absence. 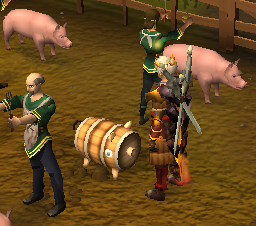 Give Eli the onions and you can finally train the pig, do so by clicking on the pig-training machine. The pig will emerge afterwards wearing the gear relevant to whether you chose a beast of burden, fighter or prayer pig. Once the pig emerges Eli will charge you with taking him around all of the major cities to show him off. Eli will give you a list of the locations to visit, those being Falador north square, Lumbridge castle courtyard, Ardougne and the Varrock fountain. 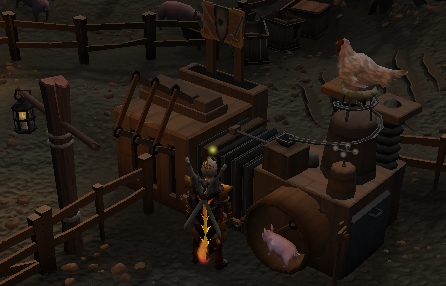 Teleport to the Falador lodestone and go just a bit south to get to the square, here you can show of your pig to the, at first sceptical, people of malleable opinions toward the uses pigs. You will leave them hungry for more fighting/praying/inventory extending pigs. To show them off at Lumbridge go east from the Lumbridge lodestone and then just to the south where you will find the awaiting crowd of citizens. Only the end of the conversation will be shown for this and the other two locations. Go north from the Varrock lodestone to get to the fountain. 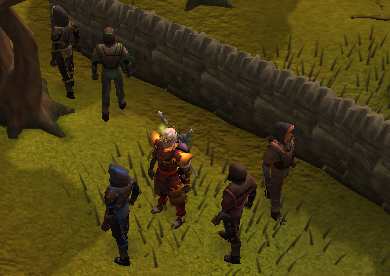 To get to the Ardougne marketplace go southeast of the lodestone. Well done! You've successfully brought home the bacon, so to speak. 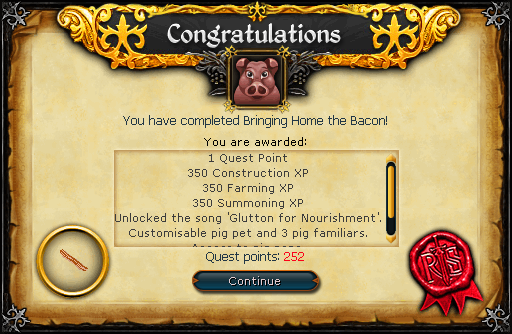 After completing the quest you gain the ability to create Spirit Pig Pouches using Eli's pig machine and the ability to create and cook bacon based food with the bacon obtained from killing pigs underneath Eli Bacon's farm. Pig teeth are dropped by Eli's pigs. There are three types of teeth: Pack, Prayer and War.